Date : Thursday 18th August 2005. 11.30 am start. Occasion : An O.F.C. 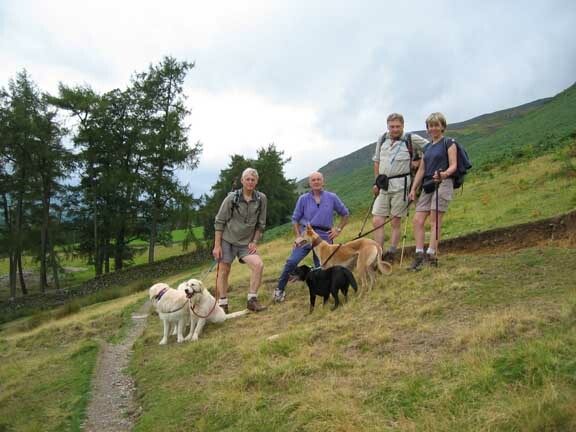 walk with friends, Fred (Phillips), Jo (Hall), John (Patterson), Ann and myself. Weather : The walk was planned for the only wet day of the week. It wasn't meant to be that way but it was! However, the poorer weather was so to arrive, so we had a fine dry walk and reasonable visibility. 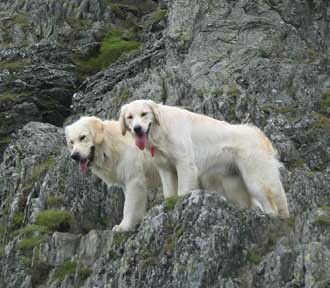 Our two dogs leading as we climbed the Halls Fell crags. As is the nature of circular walks, it doesn't matter where on the circle you start, the distance travelled will be the same. So in order to split the low level walk across the day we parked at the A66 layby just west of the White Horse pub at Scales. 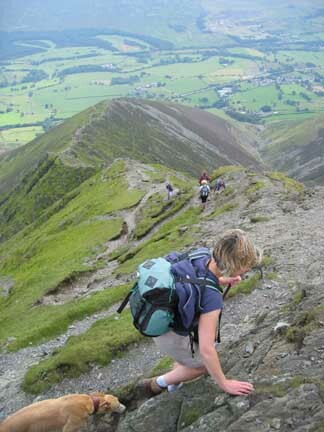 The out-take wall and path below the face of Blencathra. The weather was remarkably good, the predicted cold front had got delayed somewhere north of the Solway. 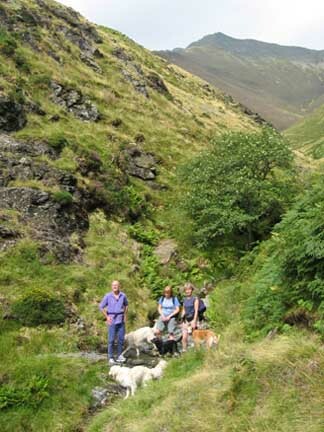 Scaley Beck crossing - three people and four dogs. 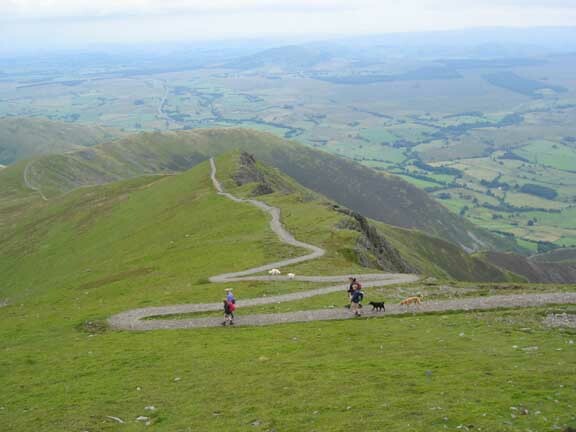 The path across the base of Blencathra looked deceptively level after a quick glance at the map, but it does in fact climb a short way up the hillside just before Doddick Gill to clear the last field before the fell. 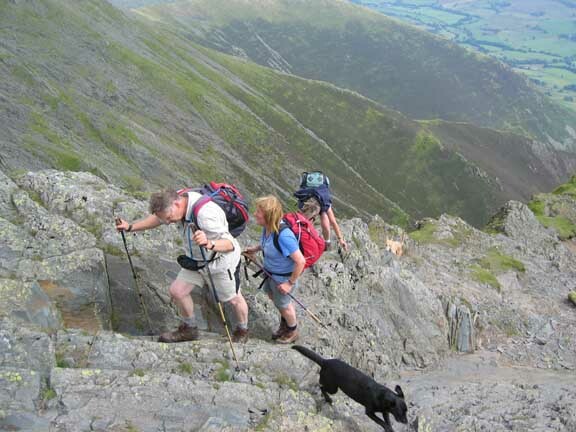 For a simple path, there were one or two little scrambles before we reached Gate Gill and the start of our main climb. 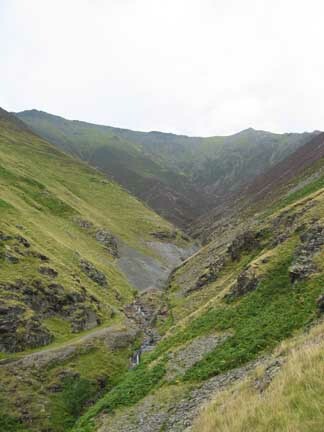 Gate Gill, with the old mine workings. The Hall's Fell Ridge as it rose before us. 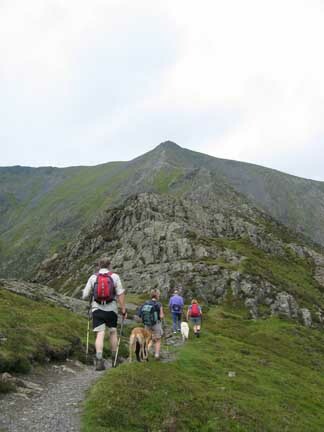 Hall's Fell is the most central of the five butress climbs of the southern face. It is all the more dramatic for the fact it tops out at the summit cairn. 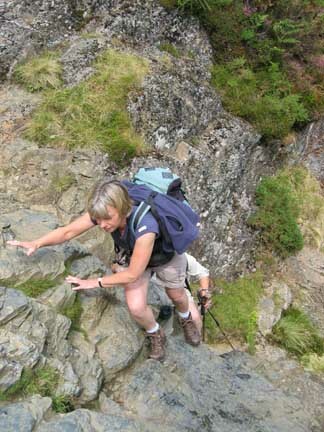 Not as exposed as Striding or Sharp Edge, but plenty of rocks to scramble up. 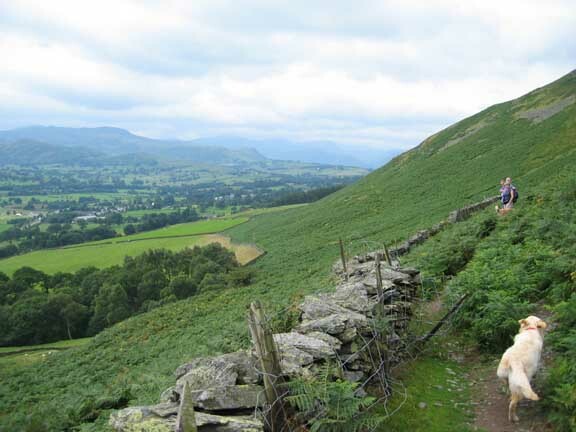 The slightly meandering path can be abandoned at times, in favour of a direct approach, which adds an element of extra fun to an already pleasant ascent. followed by her dog Jodie. 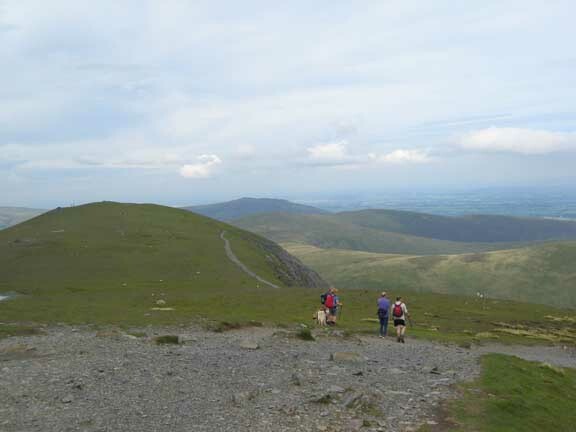 The popularity of the ascent route was notable by the well worn path on this section of the fell. 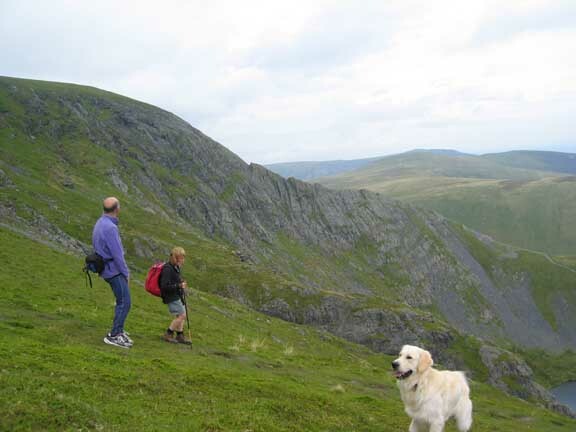 We passed one family on the way up, and this other group who were making their way down, but generally there were not many people on the fell today. The summit of Blencathra, marked by the small cairn, but notable for the ground level trig point close by. 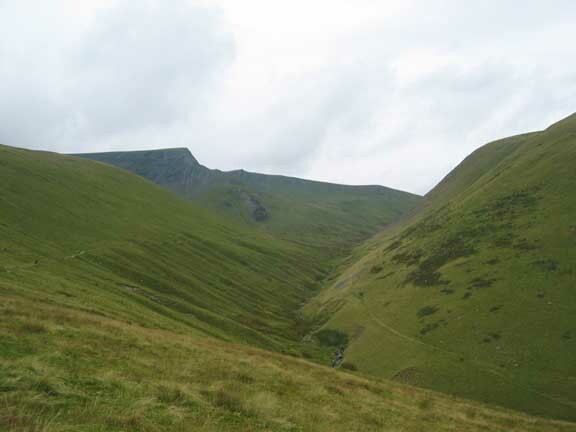 The west ridge leads to Gategill and Blease Fells, the two western butresses. a welcoming sight to every holiday maker travelling via Penrith into the Northern Lakes. An erosion scar has been repaired, and replaced by an engineered path zig-zagging its way up the last of the Scales Fell ridge. Perhaps a few less zigs and a few more years naturalisation will hide the rather unnatural look, but it certainly is a vast improvement. The new path means the erosion pressure has now gone. 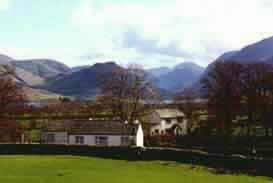 The rocky ridge in the background is the famous Sharp Edge. Scales tan and three locals. All this fellside and they choose to walk ahead of us on the path. The tarn will mean a welcome drink and no doubt a swim for the dogs. The Glenderamakin Valley as it makes it way down to White Horse Bent. Our path down can be seen on the left. 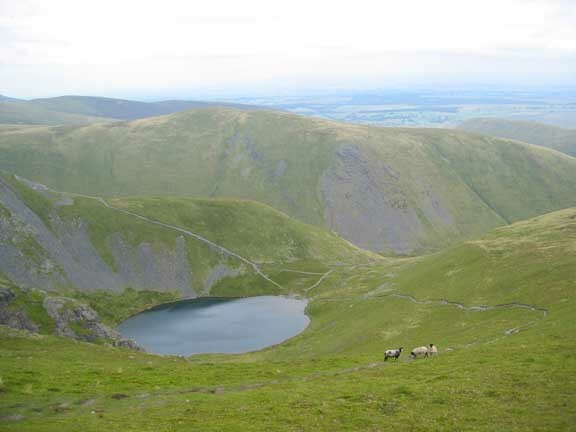 The skyline is Sharp Edge, and Scales beck exits the tarn and joins the main stream below the crags. Four out of the five party members. Myself, Fred, John and Jo. Not forgetting Harry, Bethan, Megan and Jodie in the front row, and Ann taking the photo. After a cup of something refreshing at Fornside we adjourned for a glass of something even more refreshing, and a meal, at the Horse and Farrier in Threlkeld. We were joined by Anne and Andrew, hot foot from a days paid employment, and Peter and Joanne Rigg, hot foot, but not paid. It was nine for the meal in the "snug". This site best viewed . . . with a Horse and Farrier Menu.